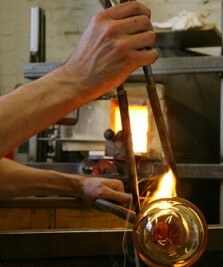 James Alexander attended Bournemouth University where he gained BA (HONS) Applied Arts (specialising in Hot Glass). James uses glass as a canvas to create abstract sceneries, which draw the viewer to look within to see the beauty of the line work that radiates out. He uses the erosion of the coastal area where he grew up as his inspiration. He is a freehand glass blower and sculptor. At present he practises freelance glassblowing for London Glassblowing, Simone More studio, Leerdam National Glass Centre (Netherlands) (Demoing Artist), Michael Rue studio, Bristol Blue Glass and Jonathan Rogers studio. Carolyn Basing will complete her MA in Glass at the University of Sunderland in October. She now has a studio in the National Glass Centre and will be working there after finishing her MA. She lives in Northumberland, just west of Newcastle, literally yards from the Roman Wall! Jason Blair was born in North West London and has lived in England and Israel. He trained as a singer and actor appearing in venues around the world. He always excelled in art at school and carried this through continuously, using the mediums of paint and charcoal. Inspiration struck him with a passion for hot glass in 2012, and in 2013 Jason found Jon Lewis, the resident glassblower at Parndon Mill, who agreed to teach Jason, and help him achieve the designs that Jason wanted to make. In 2014 he started Ahava Glass (Love Glass), which makes bespoke glass for the Jewish wedding market, reconstituting the smashed glass to create a memorable gift for the happy couple. The work on display is called 'Drop of Life'. The unique swirl, which travels one way, then back on itself, is a technique that Jason uses gravity to create. 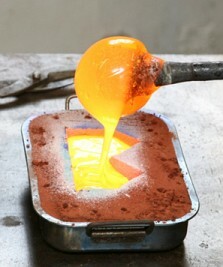 The colours are worked when still in the glory hole (reheating furnace), and the pattern is created before the piece is blown. 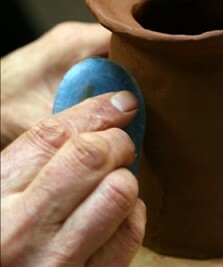 Jason is drawn to working with hot glass as its perspective is very much like singing in his opinion. It's a one shot deal, you have to get it right first time, and the glass can be as fluid as music. 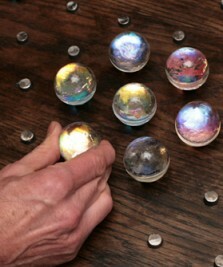 He has his own hot glass studio in NW London, which is where these pieces were created. Sarah Brown studied Applied Arts at The University of Hertfordshire, graduating with a First Class Honours degree in 2010, where she specialised in glass and used illustration in her work. She now has her own studio in Tewkesbury, Gloucestershire. Inspired by everyday life, Sarah likes to document scenes and interactions between people and their environment, enabling the viewer to see a location in a different way. Starting with people watching, then drawing and playing with depth and transparency, all of which plays a huge part in her work. Creating artwork for specific locations using local inspiration is exciting to her as it keeps work relevant and special to one place. Sarah uses a combination of techniques and processes to transform the surface; these techniques include digital processes, sandblasting, stencilling, free hand drawing and the application of gold, platinum and mother of pearl lustres. Robin Crawford is a glass artist/designer from the isle of Bute in Scotland. He started working with glass in 2005 during his time at college in Glasgow, learning a broad range of skills. 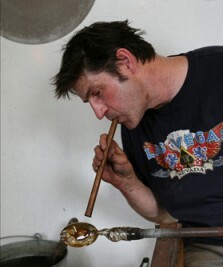 In 2012 Robin started studying at Edinburgh College of Art, learning how to blow and cast glass.This period of study has culminated in his glasswork being exhibited widely in galleries and competitions including the Stanislav Libensky Awards in Prague 2015 and Emerge 2016 in Portland, Oregon. While participating in the graduate show, New Designers, in London 2015 he was awarded the Contemporary Glass Society New Designers Associates prize. 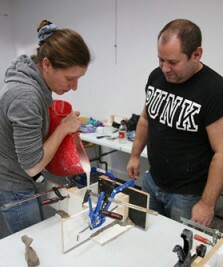 Robin's work is inspired by the interplay between human beings and their relationship with the material environment. In simple terms this refers to the world around us, our presence in it and our interaction with objects and things we have a sensory experience of in our daily lives. Jenni Pink Costello designs and makes her own original lampwork glass and jewellery. Each piece is unique and individual showing her passion for spots, circles and colour which can be seen through her bold but simple and vibrant designs. Vladimir Filipovich’s origins are in former Yugoslavia where he became an Orthopaedic and Trauma Surgeon in 1991, the same year the war broke out. he spent the whole war in Bosnia as a surgeon and upon his arrival to the UK in 1995 he started working as a trauma and orthopaedic surgeon with the NHS and he is still permanently employed by the North and East Hertfordshire NHS Trust. 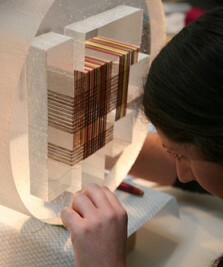 Louisa Finch received a First Class BA Hons, Design Craft degree from De Montfort University, Leicester. In 2014 she was selected by the Craft Council to participate in their scheme Hothouse 4, and in 2012 was awarded the John Cook Award for glass. Haley Haddow born in London UK, is an artist who lived as an expat in the United Arab Emirates. Influenced by architecture with strong geometry and pattern, she seeks to re-interpret the expression of line and intricate surface decoration in kiln-formed glass. Haley re-located back to the UK and commenced studying 3D Design in Glass and Ceramics at Richmond College, in 2014. Shortlisted as a finalist at the British Glass Biennale Awards 2015 she was then awarded first place in the Student Award. Haley seeks to re-interpret the expression of pattern, line and intricate surface decoration within the medium of glass, thereby developing an instinctive signature style that finds an organic rhythm to her creative process. Using form as an expressive basis, her work uses elements which create contours and textures and define shapes and patterns, allowing glass to determine it’s own narrative, aesthetic and uniqueness. Owen Johnson gained a PhD at the Royal College of Art, Ceramics and Glass Department in London and BFA (Hons), Sculpture Department, Monash University, Melbourne, Australia Owen’s works are all about opulence and intense detail, along with a loose liquid translucence. They are basically abstract paintings in glass, paintings that talk about and feed off the motif’s history, as well as taking its language into a new medium and a new abstract outcome. Freya Makin gained BA(Hons) in glass and ceramics at the University of Sunderland, and worked as artist’s assistant to Jeffrey Sarmiento, Colin Rennie and Inga Panneels at the National Glass Centre. She was shortlisted for the Durham Distillery Gin Glass Design competition. "My artwork represents an exploration of revealed and concealed memories and experiences that make-up such a fundamental part of self. In the expression of this concept a combination of colour, texture and inner space were applied and formed an integral part of the iconic, tetrahedron, pyramid shapes created. Kiln-cast and cold worked polished glass surfaces then refracted and reflected light to capture a perception of movement within the created spaces, both revealing and concealing the inner self." With her MFA in Glass from Edinburgh College of Art , Lisa Naas is continuing her post-graduate work with the School of Design at ECA and currently pursuing her PhD, which focuses on the creative process. She was fortunate to win the Principal’s Career Development Award from the University of Edinburgh to support her doctoral studies. Michele Oberdieck is a recent graduate from the Royal College of Art and also has BA Hons in Printed and Knitted Textiles from Glasgow School of Art. Inspired by natural forms, and organic structures, she explores balance, and asymmetry through shape, texture, and the gradual transition of colour. Coming from a background of printed textiles, and the 2 dimensional, her interests have been about achieving depth through surface. Her 3-D forms are meant as gestures, which flow and give an internal intensity, and luminosity. Kate Pasvol has her roots in Wales and close associations with South Africa. Originally an architect and teacher she now works on her glass sculptures in her studio in North London and in the University of Hertfordshire. 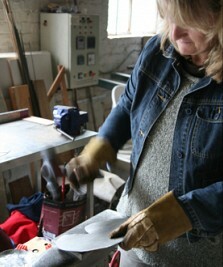 She has attended workshops in sand casting at Parndon Mill Her work involves a range of glass techniques including fusing and casting with particular reference to landscapes and the life forces within the human torso. “The way that glass can be used to capture and manipulate light is a property that really interests me and I try to use this to create three dimensional effects in my work”. Kate's work has been exhibited in various exhibitions in North London and in the University of Hertfordshire. She is a member of Contemporary Glass Society. Alex Pearce trained at De Montfort University in Leicester, completing a mixed media course on which he specialised in metal smithing and glass blowing. As he had an equal passion for both mediums it inevitably led him to try combining the materials; initially with mixed results, as they are very much incompatible. 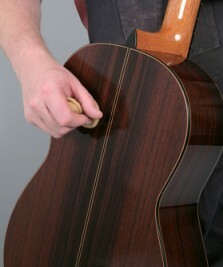 But as he resolved these issues he developed the range of work he has today. Glassblowing is more at the forefront of his work nowadays, as he is an assistant at London Glassworks, working with Master glassblower Stewart Hearn. 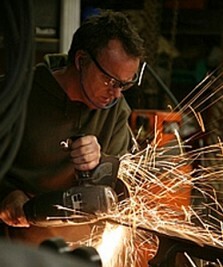 However, metal smithing remains a passion in the design and making of his own work. Jade Pinnell graduated from Nottingham Trent University with a first class honours degree in Decorative Arts. Jade gained further training as an apprentice at a glass school in Wiltshire. She has also worked for other artists including Richard Whiteley in Australia and currently works as an assistant for Fiaz Elson. 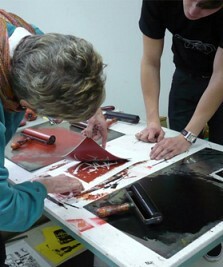 She has spent her early career making work for others and learning techniques, which informs her own work. Jade won the 'Highly Commended' award in the Glass Prize 2015 and this year she has been selected for exhibition across the country. Elinor Portnoy is a designer/artist based in London. Having studied industrial design and with several products currently in the market, she decided to enrich her practice and explore the potential of combining craft and materials with design through her studies at the RCA. A recent graduate of the Ceramics and Glass department, her current work often straddles both ends of the spectrum between art and design, creating objects that are both contextual, functional, and aesthetic. In 1959 John finished his studies at Hammersmith College of Art with National Diploma in Design, from 1960 John freelance as a prop maker for various theatres in London. 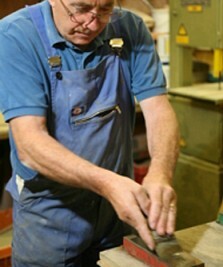 In 1973 he started training at Wadden Skill Centre as a scientific glass blower, gaining BSSG (British Society of Scientific Glass Blowers) Certificate of Competence in 1975, later he started teaching glass blowing at Westminster College using scientific glass blowing methods to make art forms. From 1995 he became Electronics technician for Barnfield College. In Justine Suesser’s practice as an artist she draws inspiration from experimenting with different materials and processes. Her work explores the notion of reality with a twist of the surreal. The "Transmutation" series in the exhibition consists of kiln formed glass pieces that are directly cast from an animal's heart. It is the closest resemblance to a human heart. The other glass piece is a core cast where the element of water formed an integral part in the process of defining the final outcome. Gemma Truman completed her BA(Hons) in Three Dimensional Design at the Manchester School of Art in 2008. Since then she has worked for and with prominent British and International Glassblowing studios and Artists, been Assistant Curator for the British Glass Biennale. She and is now working from her own glass studio in Manchester. Gemma’s work can be seen in high profile galleries in the North West of England and has been exhibited around the country including at the International Festival of Glass, the Contemporary Applied Arts Gallery and the Manchester Craft and Design Centre. Gemma makes beautiful glass objects with underlying themes of her love of nature, interest in human nature and the parallels that can be drawn between them. Alissa Volchkova is a Franco-Russian designer based in London. From 2003-2004, she studied for a foundation course in graphic design, at ESAG Penninghen, followed by a BA Interior Architecture and Product Design, at Ecole Camondo from 2005-2008. Following this, she has gained a MA Interior and Spatial Design from the Chelsea College of Art in 2010, and studied for a MA Ceramics and Glass at the Royal College of Art from 2014-2016. 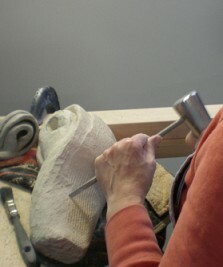 She has exhibited throughout London, including contributing to a private show curated by Sarah Griffin as part of the London Craft week in 2016, as well as participating in ‘The Emerging and The Established’ at Christie’s South Kensington. In 2015 she took part in Ceramic Art London. After several years of experience in architecture, she changed the scale of her projects to produce objects. Her work explores the industrial processes of production in a poetic way, revealing their uniqueness, and developing the potential of different materials, with a particular attraction for ceramics and glass. Alice Wheatley graduated in 2015 from Glyndwr University in Wrexham in Applied Arts specialising in glass. At the moment she is working on a self employed basis, designing and producing warm and cold glass pieces for commissions and exhibitions. She also produces some standard commercial work. She describes her work’s concept as a reflection of entrapment. Hong Kong by origin, born in the UK, Anona Wyi studied Glass at Middlesex University and the University of Wolverhampton, specialising in casting. She then went on to study at Brierley Hill International Glass School and Orrefors Glass school in Sweden, specialising in glass blowing. Having worked for several glass artists and companies around the world, teaching and lecturing both in the UK and in China, she has worked with the incredible medium of glass for 11 years. Anona is inspired by amazing journeys of glass blowing experiences around the world, from Holland to Australia, from Sweden to China. She turns different glass making techniques and styles into her own, simply enjoying the art of making. She introduces a sense of playfulness and animation into tableware glass, incorporating simple and calm forms. Her more colourful range is of experimentations with patterns and Italian making techniques. She now still enjoys marrying form and function together, adding iridising and steam wear to her box of tricks.